Hank Hooper is the head of Kabletown. He is a "family man", and also a Vietnam veteran. He often is enraged at Jack's handling of TGS, but always has a very happy mood, characterized by incessant laughter while at the same time directing thinly-veiled insults and threats to Jack and his staff. 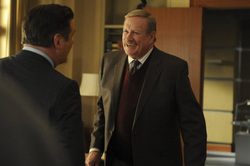 Hank Hooper is portrayed by Ken Howard.